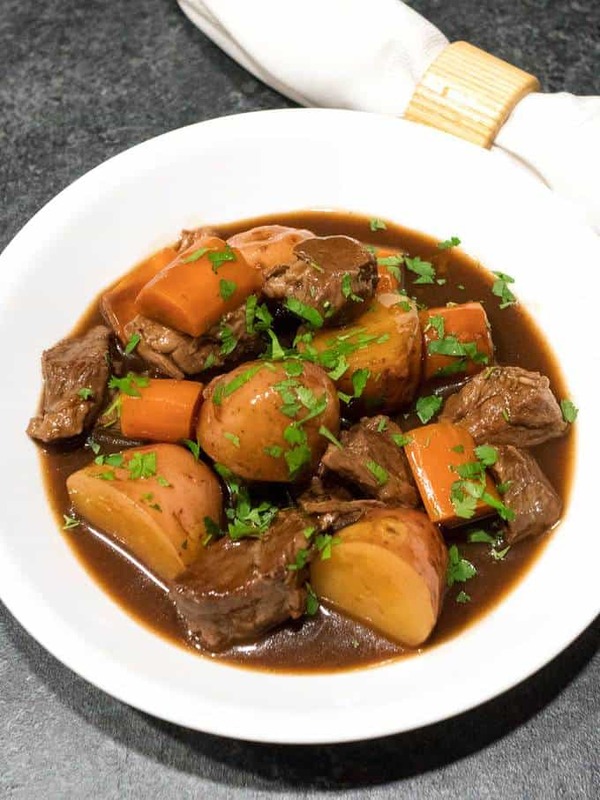 Slow Cooker Irish Guinness Beef Stew is comfort food at its best. It boasts tender chunks of beef with potatoes and carrots braised in a rich Guinness-infused gravy. Perfect for St. Patrick’s Day! I used the following ingredients for this hearty stew, which I adapted from an America’s Test Kitchen recipe: Beef chuck roast, vegetable oil, onions, low sodium chicken broth, Guinness Draught, light brown sugar, dried thyme, bittersweet chocolate, carrots, baby red potatoes, salt, freshly ground black pepper, Worcestershire sauce, and Bisto. You might think that bittersweet chocolate is an odd ingredient. Actually, it enhances the flavor of the Guinness without introducing harsh undertones. The preferred Guinness for this stew is the Draught rather than the Extra Stout. The reason is that the Extra Stout tends to leave a slight bitter aftertaste. I started by trimming the chuck roast of as much fat as possible and cutting it into chunks. Then, I patted it dry with paper towels. This is a trick learned from Julia Child. Next, I sprinkled some salt and freshly ground black pepper on the beef. Then, I browned it in batches in a large skillet over medium high heat with a bit of vegetable oil. When the beef was browned on all sides, I transferred it to my slow cooker. After all of the beef was browned, I added the onions and some salt to the skillet with a bit more vegetable oil. I cooked the onions until they were lightly browned. This took about 5 minutes. Then, I added the chicken broth, Guinness, brown sugar, thyme, and bittersweet chocolate to the onions. I reserved 1/4 cup of the Guinness to add at the end. I brought the mixture to a boil, and used a wooden paddle to scrape up any browned bits in the pan. Then, I poured the onion/Guinness mixture over the beef in the slow cooker, and added the carrots and potatoes. I covered the slow cooker, and cooked the stew on “normal” slow cook for 8 hours. I used my Instant Pot for this. If your slow cooker doesn’t have a “normal” slow cook setting then cook the stew on low for 9 to 10 hours, or on high for 6 to 7 hours. After 8 hours, I uncovered the slow cooker, and transferred the meat, carrots, and potatoes to a large bowl. Then, I poured the liquid into a wire strainer set over a large bowl, and discarded the residue left in the strainer. Next, I poured the liquid into my fat separator, and let it sit for about 5 minutes to allow the fat to settle on the top. Meanwhile, I rinsed out the slow cooker insert, and returned the meat, carrots, and potatoes to it. 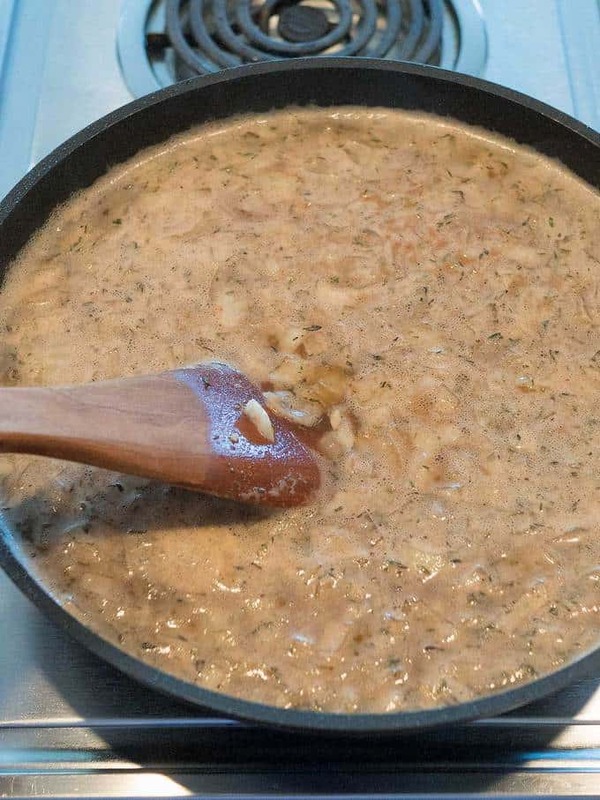 I poured the liquid into a 12-inch skillet, being careful to leave the leave the fat in the fat separator. Then, I added the remaining Guinness that I had reserved. 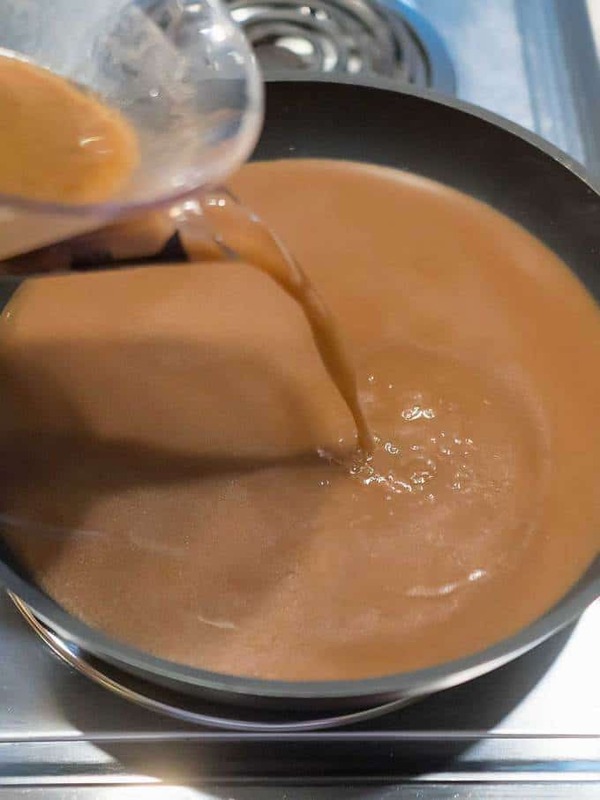 I brought the liquid to a boil, and stirring constantly, whisked in some Bisto mixed with chicken broth to thicken the gravy, along with some Worcestershire sauce. 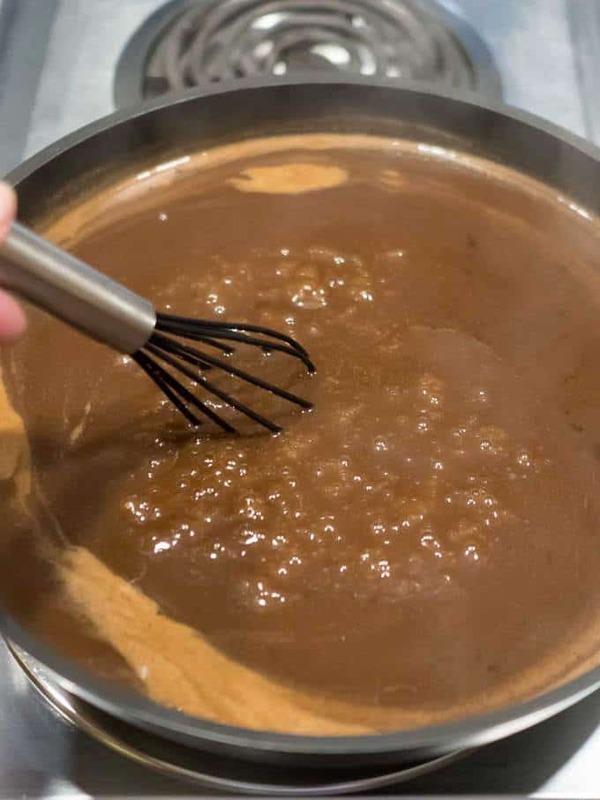 At this point, I tasted the gravy, and thought that it needed a bit more pepper. I poured the gravy over the meat, carrots, and potatoes, covered the slow cooker, and set it on high for another 30 minutes to ensure that everything was well heated. The meat was fork tender, and the carrots and potatoes were perfectly cooked. 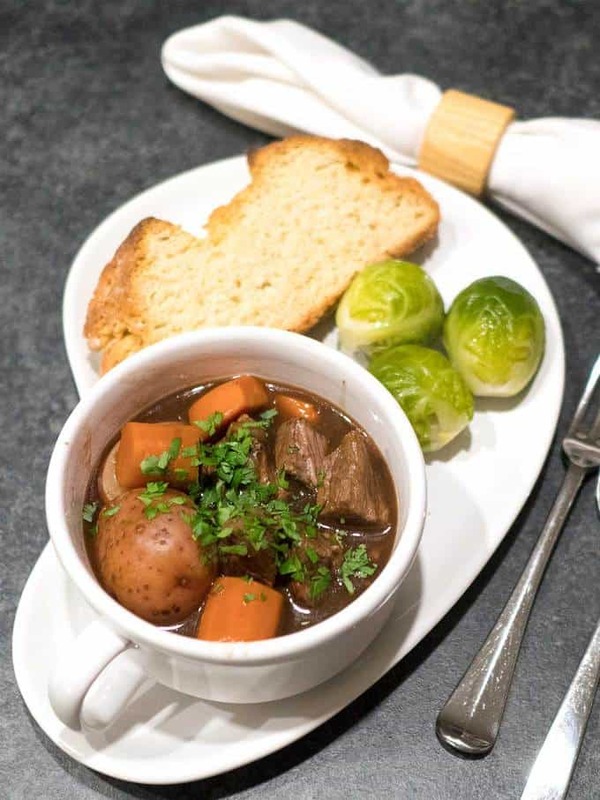 I served the Slow Cooker Irish Guinness Beef Stew with some freshly baked Irish Soda Bread, and steamed Brussel sprouts. Yum! 1 1/2 pounds baby red potatoes scrubbed. If large, cut so that chunks are about 1-1/2 inches. 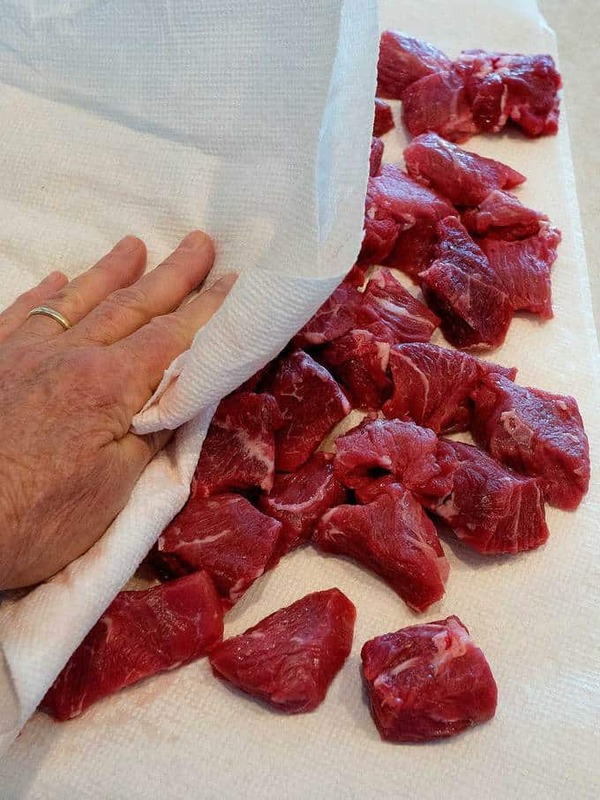 Pat beef dry with paper towels and sprinkle with salt and pepper. Heat 2 teaspoons oil in large skillet over medium-high heat. Cook single layer of beef in batches until browned on all sides, about 8 minutes. Transfer to slow cooker insert. 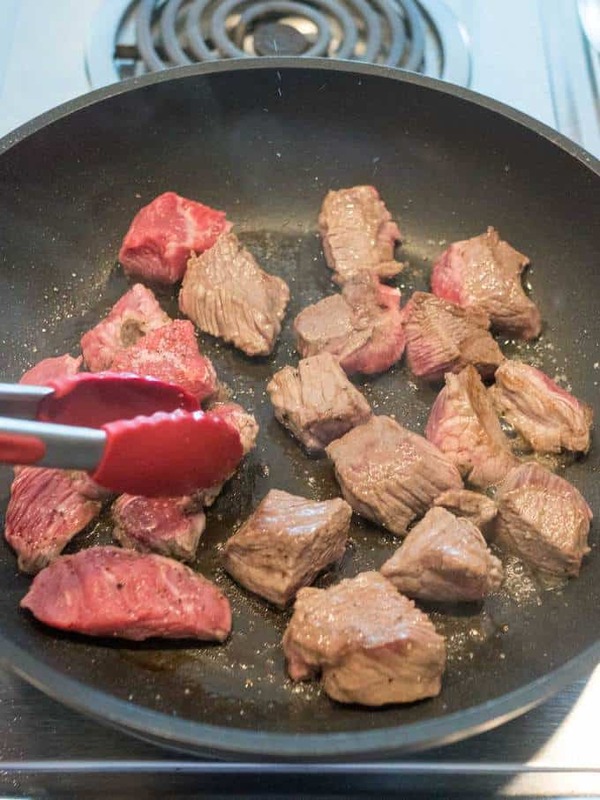 Repeat with additional 2 teaspoons oil and remaining beef. 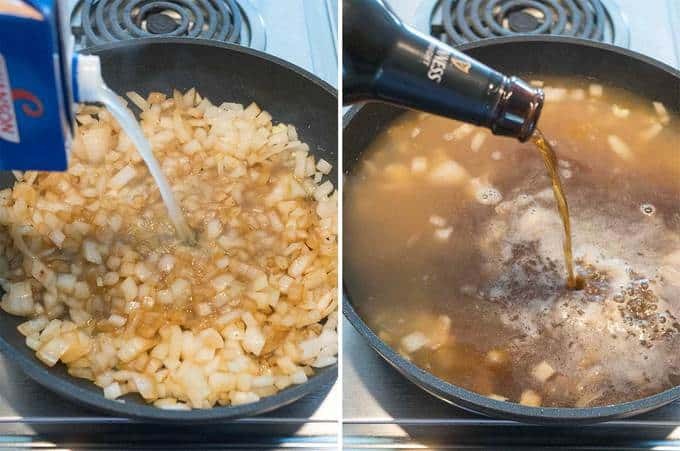 Add remaining 2 teaspoons oil, onions, and 1/4 teaspoon salt to skillet and cook until onions are lightly browned, about 5 minutes. Add broth, 1-1/4 cups Guinness Draught, sugar, thyme, and bittersweet chocolate; bring to boil, using wooden paddle or spoon to scrape up browned bits. Transfer to slow cooker insert. Add carrots, and potatoes to slow cooker insert. Cover and cook on low until meat is tender, 9 to 10 hours (or cook on high for 6 to 7 hours). Uncover slow cooker; remove beef, carrots, and potatoes to a large bowl with a slotted spoon. Pour liquid into wire strainer set over large bowl. Discard residual bits in strainer. 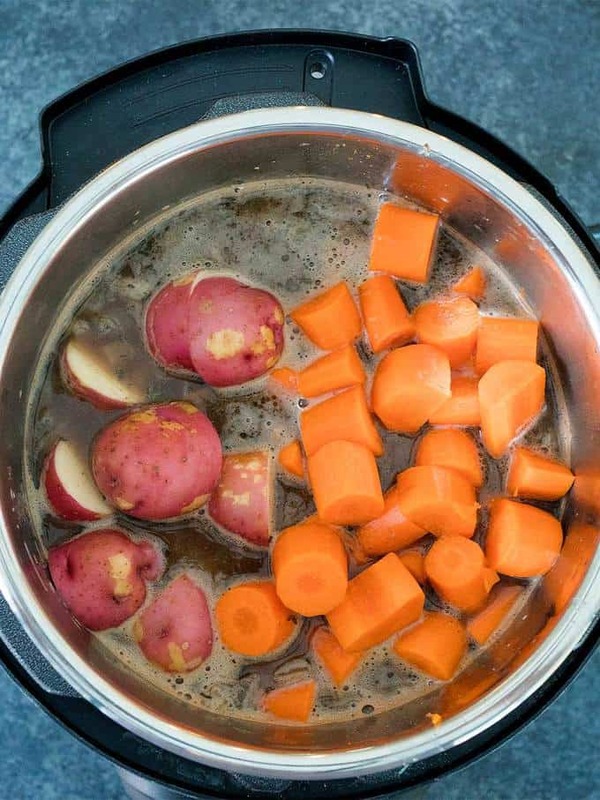 Wipe out slow cooker insert; return beef, carrots, and potatoes to slow cooker. Pour liquid into fat separator. Allow to settle for 5 minutes. Pour liquid into 12-inch skillet. Add remaining 1/4 cup of Guinness and Worcestershire sauce. Bring to boil over medium high heat. Whisk together Bisto and chicken broth. Whisk into liquid, stirring constantly until liquid thickens. Adjust seasonings. Pour thickened gravy over beef, carrots, and potatoes in slow cooker. Cover and cook on high for 30 minutes or until thoroughly heated. Serve. Mmmm. 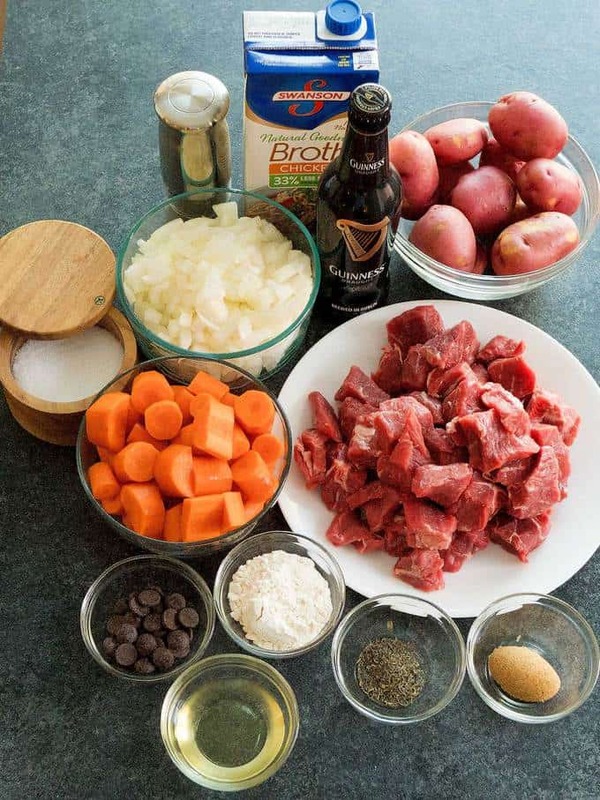 I love beef stew, especially with Guinness. Oh, and the chocolate. I love it! I really appreciate the pictures of the step by step process of making this! Pinned it! I love the idea of beer in this stew! Can't wait to try it!! I was a bit concerned that the bitterness of the beer would dominate the flavor, but that didn't happen at all. It was delicious! I love this kind of comfort food, yum!